A word cloud (“Wordle”) of the most commonly used words within this chapter. Lucia Lorenzi, 2018. This week’s featured CanLit Guides chapter is “Literary Censorship and Controversy in Canada” by Lucia Lorenzi. 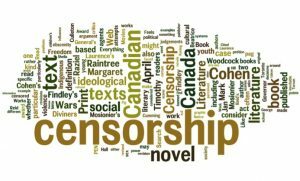 This chapter introduces you to literary censorship in Canada, looking both at positions taken by Canadian scholars on the practice of censorship and its effects, as well as at specific examples. We will analyze controversies around three texts to better see how the censorship of Canadian literature works in practice: Timothy Findley’s The Wars (1977) and Beatrice Culleton Mosionier’s In Search of April Raintree (1983) provide examples of censorship where the authors themselves were involved in contesting or responding directly to critics in their texts; Raziel Reid’s When Everything Feels Like the Movies (2014) provides an example of a contemporary attempt to strip a novel of its literary award on the basis of its allegedly controversial content.